The photographs of amateur photographer Yurii Aleksandrovich Galev (1929 — 2006), a teacher from the village of Vozhgora in Arkhangel’sk province whose archive forms the basis of the exhibition, depict an everyday life which to some extent has already become a part of history, although when we look back at it we discover features which are familiar to us today. The photographs for the exhibition were chosen with a particular aim in mind — to reveal through images the pattern of relationships between individuals, whose heirs are the Russians of today, in other words ourselves. Looking at these relationships fixed in the photograph is one way of seeing and understanding ourselves and access to our own cultural memory is one of the most important conditions for comprehending the present and creating both our own personal future and the future of others in general. 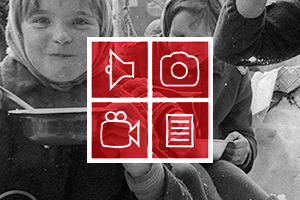 “The Propp Centre”, which is a Nongovernmental Nonprofit Organization studies the social and cultural heritage of Russia, most importantly as it relates to the current situation ,artistic, cultural, social and politiccs. One of the activities of the Center is field research. In 2012, while working in Vozhgora (a village in the Leshukonsky district of Arkhangelsk province), we noticed some photographs lying, together with clippings from newspapers and magazines, behind the stove in the house where we were living. ,When we enquired about the identity of the photographer Yurii Galev’s relatives gave us some old films, stored in the attic of his house. There turned out to be more than five hundred of these, many of which were in good condition. Now the electronic copies of these photographs form a separate thematic collection within the electronic archive “Russian every–day life”, in the creation of which the Propp Centre has been engaged for more than 15 years. Through the exhibition we aim to demonstrate one of the most important qualities of Russian everyday life — people's ability to create, maintain and display private, i.e. not sanctioned “from above”, bonds of kinship and friendship. As noted by the sociologist Pierre Bourdieu, most domestic photographs express, regardless of the personal intentions of the photographer, the patterns of perception, thought and values which are common to the group as a whole. Through the photographs we intend to show that these same values are shared equally by both photographer and community: the photographer Yurii Galev was a member of those groups he captured in his photographs. In their gestures, in the poses they adopt, in the way they look at us, we recognize values and patterns of perception and orientation, which are familiar to us. Yurii Galev provided his boxes of films were labeled with a brief commentary, an indication of the place where he took the photograph or his reasons for taking it. This information appears in the captions used in the exhibition, retaining the original abbreviations and spelling.